Race Organisers deserve systems and processes to make their lives easier. Entry management and race preparation is about to get a whole lot less time consuming. EntryBoss is the first system built specifically for club race management. 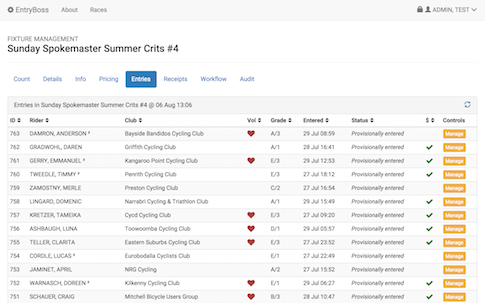 Designed and developed by a team close to the sport - we are race managers and competitive cyclists ourselves - EntryBoss gives you hours of time back, to get on with what you love: running bike races. We are set on making EntryBoss the world’s leading race management system, catering specifically to the needs of race organisers and entrants. You can help us by using EntryBoss and by contributing your ideas. If you can imagine it, we can build it - and we invite you to be part of our journey. Early adopters literally get to help build the system of their dreams. ABOUT US: We are bike racers, race organisers, system developers and process nerds. We started building EntryBoss because we saw a desperate need to improve this important area. EntryBoss is already in use and well- progressed - with a lot more to come. CONTACT US for a demo. We are confident that you will be impressed! We’ve got three packages, designed to help clubs of all sizes. Includes all entry & race management features. Max 60 entries per race. For larger clubs and events. Max 200 entries per race. Includes all entry, race & series management features. Max 500 entries per race. With beta customers now - please ask. Our payment service has very low merchant fees of 1.2% + 30c per payment (for Australian domestic payment cards). It is up to you whether to absorb the merchant fee or pass it on to entrants. Our experience is that these costs are more than recouped by reduced ‘no shows’ once your event goes pre-paid. All packages offered in conjunction with our standard T&Cs and therefore governed by our Agency Agreement. You don’t pay upfront. We are acting as your agent in collecting entry fees, and will simply deduct our rate from your final transfer. By listing events with EntryBoss you accept our Agency Agreement that governs, amongst other things, how and when payments & refunds occur. CONTACT US at info@entryboss.cc and ask for a demo.